Influencer marketing is already a billion dollar industry. So it’s no surprise that there are scammers trying to take advantage of it and fooling brands into work with them. These could be real people who are faking their influence by buying followers. They could also be scammers building fake profiles and buying followers. Either way, investing in these fake influencers can result in wasted marketing dollars because you wouldn’t get the desired results. Since the followers of these influencers are mostly bots and ghost followers, their likes and comments are either bought or non-existent. This also means you wouldn’t be able to reach real people, let alone your target audience. So you’ll be spending money just to speak to an “audience” that won’t hear you no matter what. 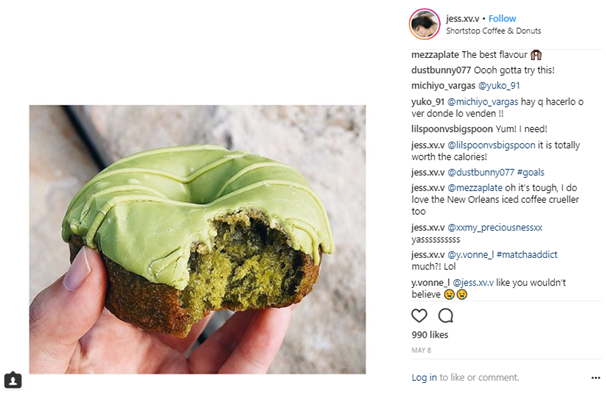 This makes it crucial to try to spot fake Instagram influencers before you execute an influencer marketing campaign on Instagram. This post will provide you with a detailed guide on how you can tell the difference between fake and authentic Instagram influencers. One of the easiest ways to spot a fake Instagram influencer is by analyzing their engagement rate. If you see that an influencer has millions of followers but an extremely low engagement rate, it’s a clear sign that there is something suspicious going on. 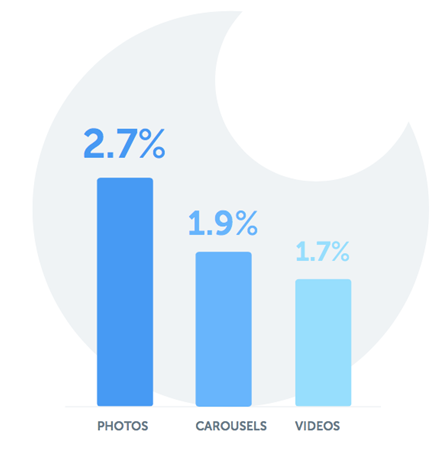 Before you analyze an influencer’s engagement rate, take note that the median engagement rate for Instagram photos according to Iconosquare is 2.7%. You can use this number as a benchmark to measure an influencer’s engagement rate. However, engagement rates tend to be lower when a user has a large following. So influencers are likely to have a much lower engagement rate than this median rate. Use it only as a reference and not as a rule. 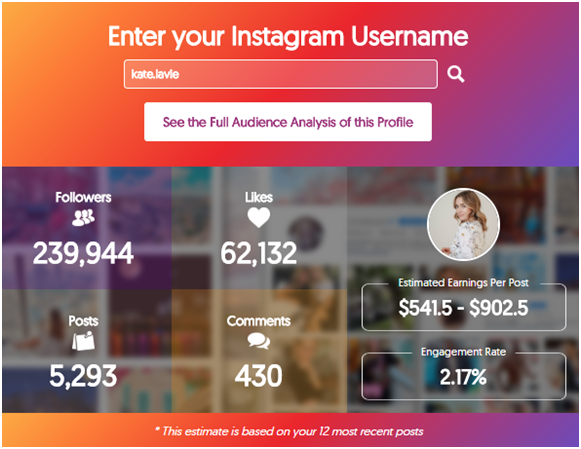 An easy way to calculate an influencer’s Instagram engagement rate is by using the IMH Instagram Money Calculator. You just enter the user name of the influencers you wish to analyze. And the tool will automatically calculate factors like following size, like rate, comment rate, and number of posts. Based on this data, it will provide you with an accurate engagement rate. In addition to this, it would be helpful for you to look at some of their posts from a couple of months back. Did those get a lot of engagement as well? If not, there’s a good chance the influencer has purchased the likes and comments on their recent posts. In this case, it would be wise to take a closer look at the likes and comments they’re getting on their recent posts. Look at the usernames and try to check out a few of the accounts to see if they seem legit. Some of them may have weird names or no profile pictures, and they may even leave generic comments. Another clear sign of fake influencers is in their follower to following ratio. Authentic influencers will likely be following only 1-5% of their total followers. So if a potential influencer has a much higher “following” rate, it’s possible that they’ve participated in growth hack tactics or used bots to grow their following. In other words, they don’t have actual influence on real human beings. They don’t have actual expertise or a personal brand that can help you market your brand effectively. Be wary when an “influencer” is following thousands of accounts, because it’s likely that these are fake influencers. They might have followed several bot accounts or fake accounts to get a follow back and grow their following. The following influencer, Lisa Linh has 95k Instagram followers. But she is only following 604 accounts. This is a clear sign that the influencer is authentic and has grown her following organically. She is likely following only the accounts that really matter to her, like her friends and family, her favorite celebrities, and her favorite brands. Fake Instagram influencers are easy to spot through the way their community engages with their posts. You need to see whether the community is engaging in real conversations with the influencer. This would be a sign that the influencer has a lot of relevant comments from genuine followers. Fake influencers, on the other hand, would get a lot of vague comments and emoji comments that can work on any post. For example, let’s take a look at a well-known fake influencer profile @calibeachgirl310. If you look through the comments on some of the posts, you’ll be able to see examples of automated comments. Comments like “cool,” “nice shot,” “incredible.” etc. can work on any post and are usually created by bot accounts. You might find comments such as these in some authentic influencer accounts as well. But that is bound to happen when your account is public and you have a lot of visibility on Instagram. What’s alarming is when these vague comments clearly outweigh comments coming from real people. 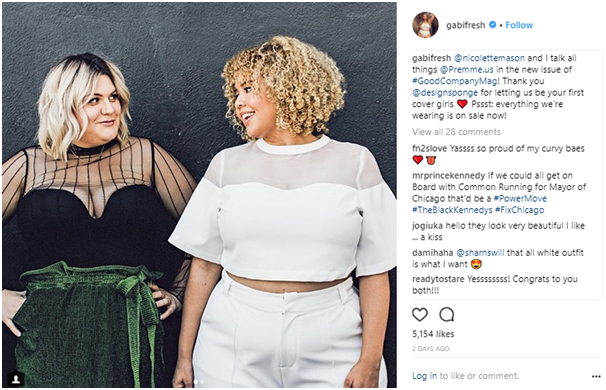 If you look at real influencers like Gabifresh, for instance, you will see that the comments are clearly coming from real people who read the caption. Her community is engaging actively with the posts and even asking questions about where they can buy clothes like hers. You should also look for influencers who respond to their comments like real humans would. There might be influencers who respond with a “thank you” or with emojis. But if you look at influencers like Jess Vuong, you’ll see that she is actively engaging with her community. Not only is she acknowledging the comments, she is also sharing her opinions through the comments. Sometimes, you can also tell a fake Instagram influencer from an authentic one by looking at how long they’ve been active on the platform. This may not always be applicable in case an influencer has grown their influence on other platforms like YouTube and Twitter and has only created an Instagram account recently. In this case, they’re naturally going to get plenty of followers in a short span of time. But usually, Instagram influencers have built their influence over the years. They have put in tons of hard work and time into growing a dedicated and loyal following. So you should look at the earliest posts they’ve created to see when those posts were created. However, this may be a grueling task especially if the influencer has hundreds of posts. Plus, it may not be too viable in case of influencers who regularly delete their old posts. 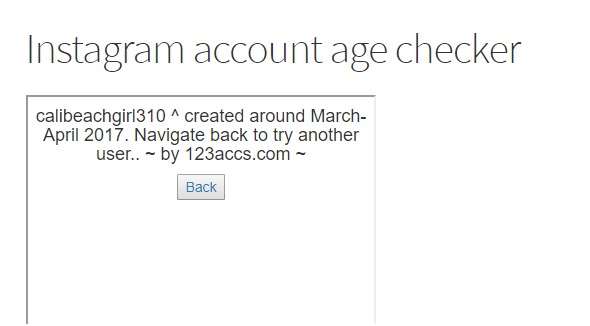 Although there aren’t too many tools that can help you check Instagram account age, you can use the Instagram Account Age Checker from 123aacs. The tool is a bit inconvenient to use as you can’t copy and paste the username. You’ll have to manually type in each user name individually. But it will give you accurate information about when the account was created. You should be suspicious of fairly new Instagram account with tens of thousands of followers. There’s a good chance they have bought their followers. So a majority of their following would be unengaged with their content. The previously-mentioned fake influencer, @calibeachgirl301, for instance, has 45.1k followers. And if you look at the account age using the tool mentioned earlier, it was only created between March and April 2017. That’s not enough time to grow that level of authentic following organically. Additionally, you can also look at their follower growth rate, which is another related metric. An account that experiences a sudden and significant hike in followers is likely one that has purchased those followers. On the other hand, authentic influencers will experience a steady growth in followers over time. There is no tool dedicated just to track follower growth rate of influencers. But you can check out the features of different Instagram analytics tools to see which one can help you view the follower growth rate of potential influencers. 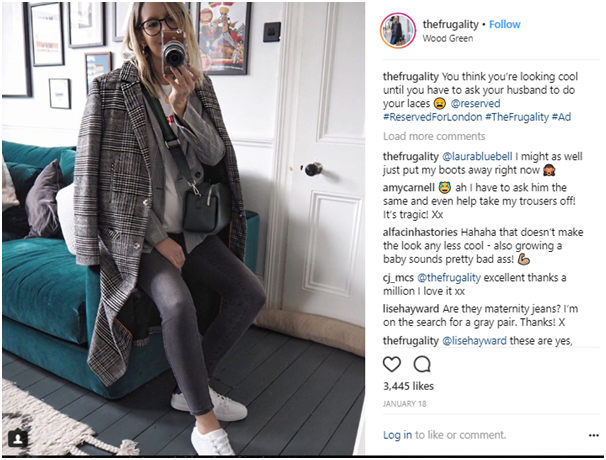 As mentioned earlier, many brands have already been fooled into working with fake influencers. This is good for you in that you can use their previous collaborations to determine their authenticity. Look through their posts and see what kind of products they’re promoting. Are they consistent with their personal brand and niche? Fake influencers will likely promote each and every product regardless of industry. Remember, they’re doing this for the money. They don’t really care about how their collaborations will affect their personal brand image. So you can find them promoting a clothing brand in one post and a mobile app in another. Authentic influencers, on the other hand, tend to be very picky about the brands they work with. Since they have a personal brand to maintain and continue building, they only collaborate with brands that resonate with them and are relevant to them. They will be consistent in the niche they’ve specialized in and ideally only work with brands relevant to the niche. To ensure that the influencers you want to work with are real influencers, you should see if they have managed to build their presence on other social media platforms. Not every influencer may be present on other social media platforms. But authentic influencers are likely to have at least one more social profile than the one they have on Instagram. Many authentic influencers will have a blog through which they share their expertise and ideas in a more detailed manner than on Instagram. But even if they don’t have a blog, they might have an account on either Twitter or Facebook. So you should conduct a search for any sign of their existence as a real person on some of these platforms. You’ll see that many authentic influencers such as Liz Wible will include a link in their bio to their website or blog. Fake influencers will likely not put in the effort to create a blog or website. All of the tips mentioned above are highly effective for detecting fake influencers and determining which ones are authentic. However, the most effective tactic is to actually go through the influencer’s Instagram feed and examine the quality of content they produce. Do they seem to actually put in the time and effort to create content that engages their audience? Look at the image quality and the captions. Does the influencer seem to have the ability to create high-quality content? And when they create sponsored posts, do they seem to portray the product in a way that will resonate with the audience? If you look at influencers like Alex Stedman, for instance, you can see that she really puts in an effort to create quality content. She posts high-quality photos with captions that really speak to her audience. Even in the screenshot shown above, you can see that her caption is relevant to the shoes that she’s wearing. And since the post is a sponsored post for a shoe brand, it’s highly relevant, proving her authenticity. These are some of the most effective tips that you can use to determine whether an influencer is fake or authentic. Use them when you’re vetting potential influencers for an upcoming campaign. This will help prevent you from wasting your valuable marketing dollars on influencers whose followings are made up of bots and ghost followers.